Hey guys! 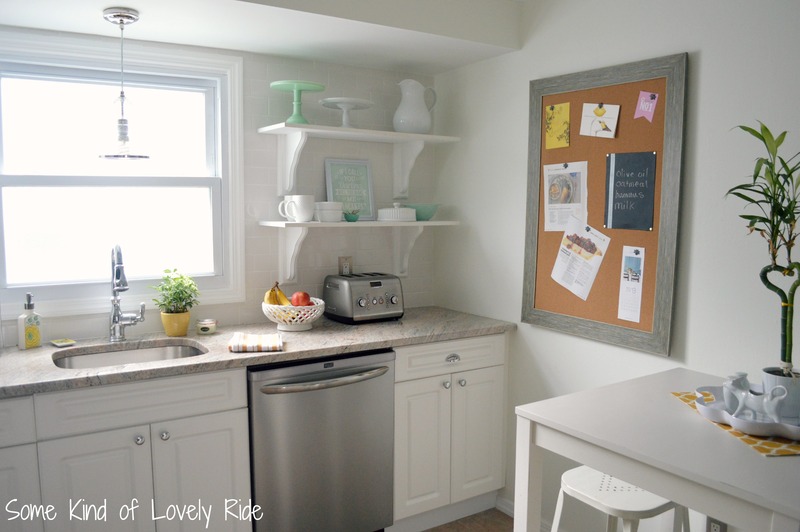 As promised, I’ve got a list of sources from our kitchen makeover. The big purchases get a paragraph all to themselves, while the little items & accessories are noted in the picture captions! 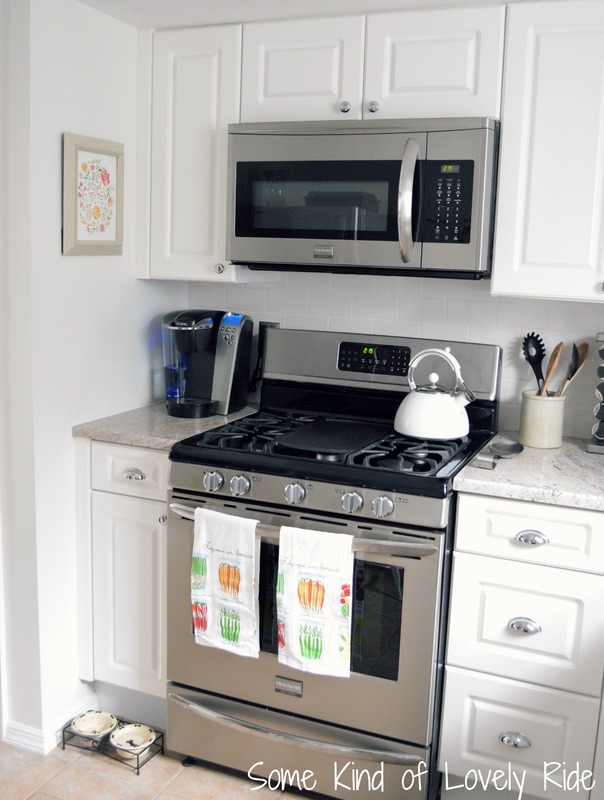 Appliances – Frigidaire Gallery Collection (stove, dishwasher, over-the-range microwave & refrigerator). I absolutely LOVE the smudge-proof stainless steel finish. It looks great and has been really easy to keep clean. I particularly love the gas range we purchased, which has an interchangeable center griddle plate that has been really useful for Saturday morning pancakes, grilled cheese sandwich making, etc. Granite – Our granite is called Ivory Fantasy. We did a lot of comparing of different counter top materials & prices, and in the end were really happy with the price & the overall look of this granite. The goal was to find a light colored design that would go with our tile floor (new flooring was not in the budget! ), yet work with the new stainless steel appliances & chrome details. It has browns and greys running through it, and in person makes a nice but subtle contrast with the white cabinets/tile/walls. Soap Dispenser – Sea Salt & Lychee from Anthropologie; Ring Dish – Nordstrom; Weck Jar Candle -The Farmhouse Store; Yellow Striped Dish Towel – Pottery Barn. 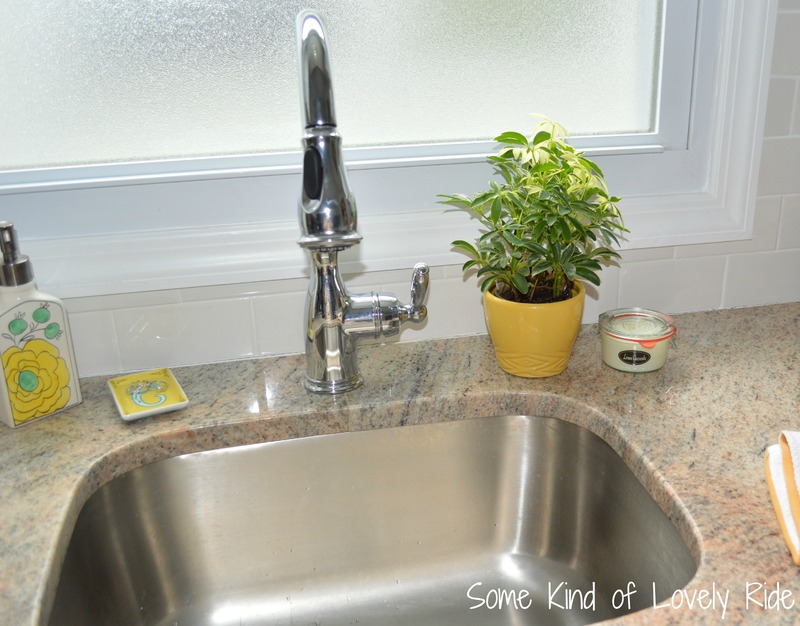 Pendant Light – I’m in love with the pendant light above our sink. It looks a lot like this expensive (beautiful) pendant light that I loved when I made my kitchen mood board – except it is $100 dollars less from the Home Depot Home Decorators Collection. It’s super beautiful in person – even though I had a hard time capturing it in these photos. But I love love love it! 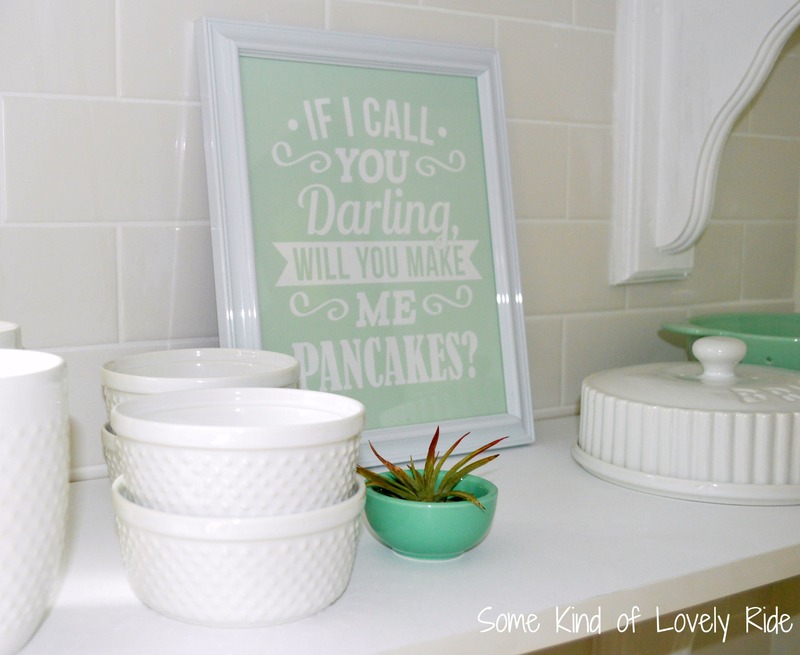 Jade Cake Stand – Shop Sweet Lulu; White Cake Stand & White Pitcher – Pottery Barn; Mugs & Bowls – Threshold Beaded Collection (Target); Artwork – Eat. Say. Love. ; Brie Dish – Target; Berry Colander – How to Live Too, Beach Haven LBI; Fruit Bowl – Target. 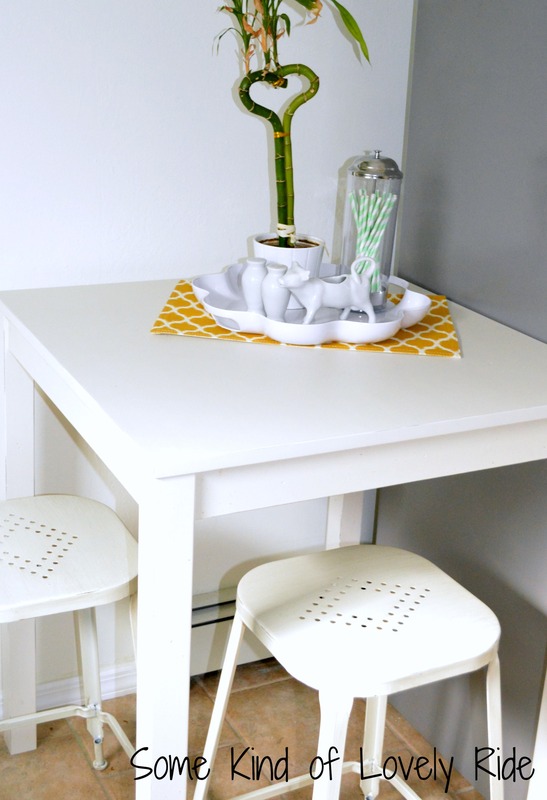 Pub Table – Nantucket White Bistro Table from Home Depot (except we shortened it by about 8 inches); Stools – Pier 1 Imports. 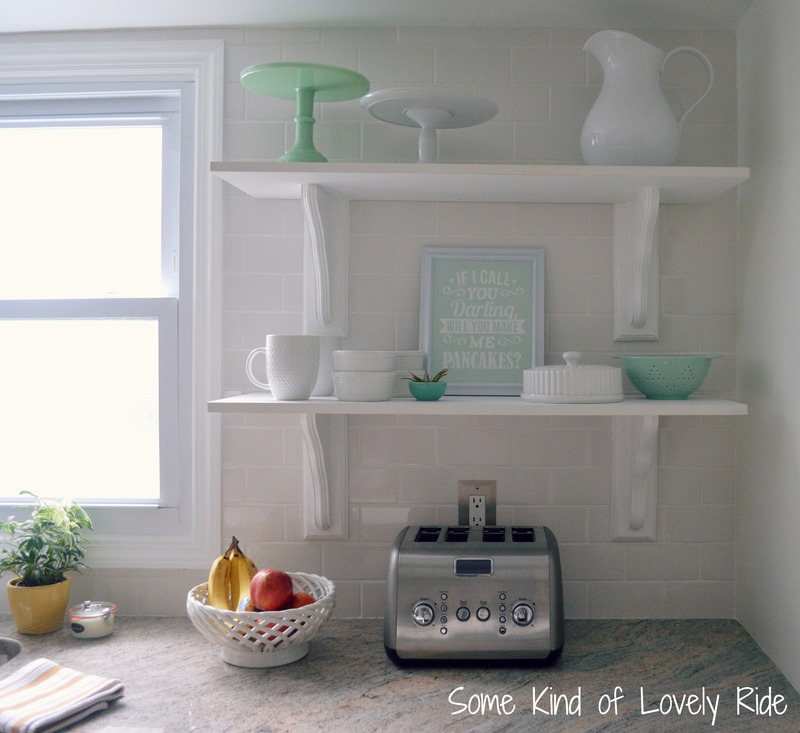 Some of our other additions included the 2″ x 6″ white subway tile (Home Depot), the white shelves & corbels, and the crown molding (Home Depot via contractor prices). I’m so happy with our new kitchen – it is fresh & cheerful, and meets all of our practical needs. I especially love all the endless possibilities for playing with color & decor against the white/neutral room! So, what do you think guys? And do you have any kitchen projects going on right now, too? I’d love to hear about them! 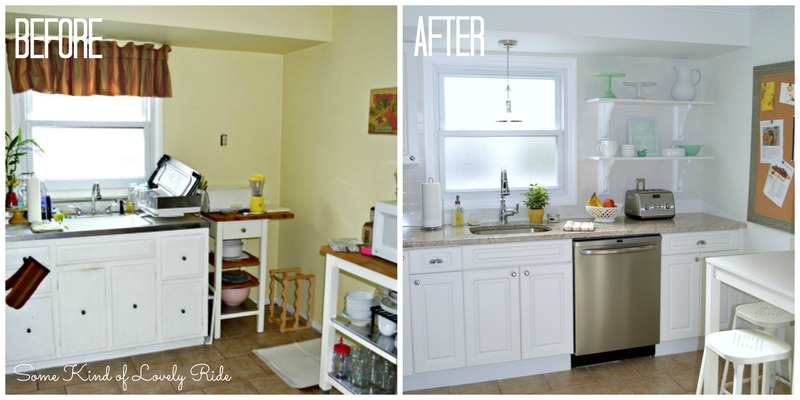 Shortly before my recent hiatus, I was sharing updates on our kitchen renovation project. At long last, I think it’s time to share some photos of the finished product! Our little kitchen started out with old & yellowing appliances, short amounts of cabinets & counter space, and a glaring lack of a dishwasher. With thanks to our contractor-neighbor, we designed (but did not DIY) our way into a new kitchen! My favorite part of the new kitchen is the shelves. I’ve been playing with the arrangement over the past couple of months – right now the items on the shelves are part decorative, part practical. Using my pistachio stand mixer as inspiration, I collected a few pieces in the same color scheme to use as accents against all the white. The berry colander was a lucky find at a boutique store in LBI this past summer, and the jade cake stand is from Shop Sweet Lulu. 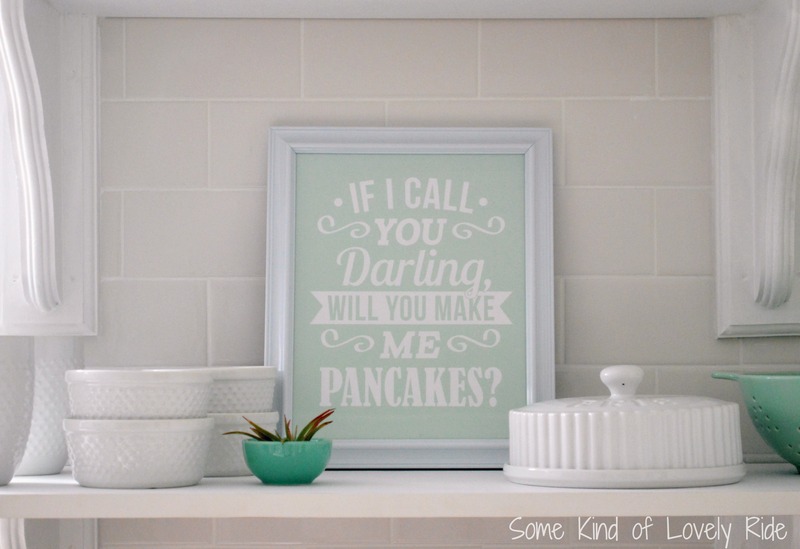 And that adorable print is from the Etsy shop Eat.Say.Love. The quirky song lyrics make me smile every morning! 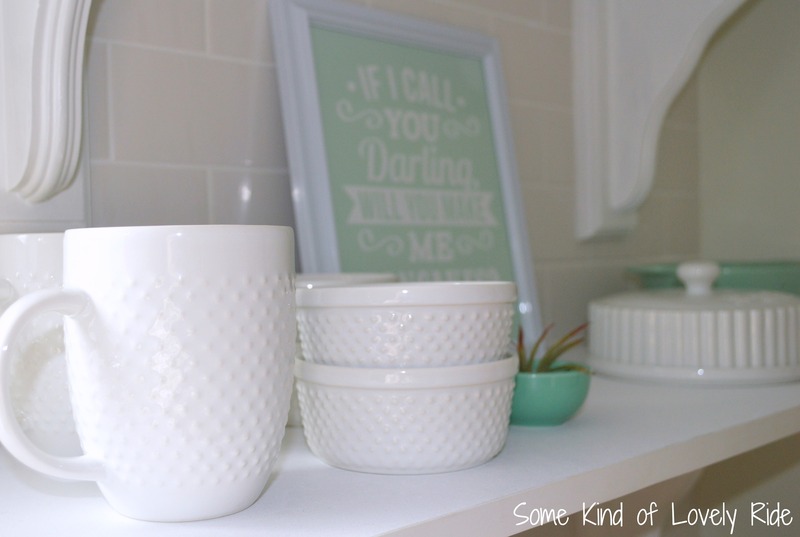 And for those of you considering open shelving but worried about dust, so far I’ve found that we use the white mugs & bowls (from Target) almost daily, so they never really have time to collect dust. When I need the colander or a cake stand, I just give them a quick rinse & all is well! Also on my list of top three favorite things about the new kitchen are: the dishwasher (seriously, life changing), and the seating space we were able to add. Before, we had such a lack of cabinet space (with only lower cabinets), that we had two kitchen carts on the empty wall to stash our dishes & things. Now with everything neatly tucked away in its place, we have the room for a small table & two stools. It’s an extra eight square feet or so of prep space, plus a great spot to grab a bowl of cereal. 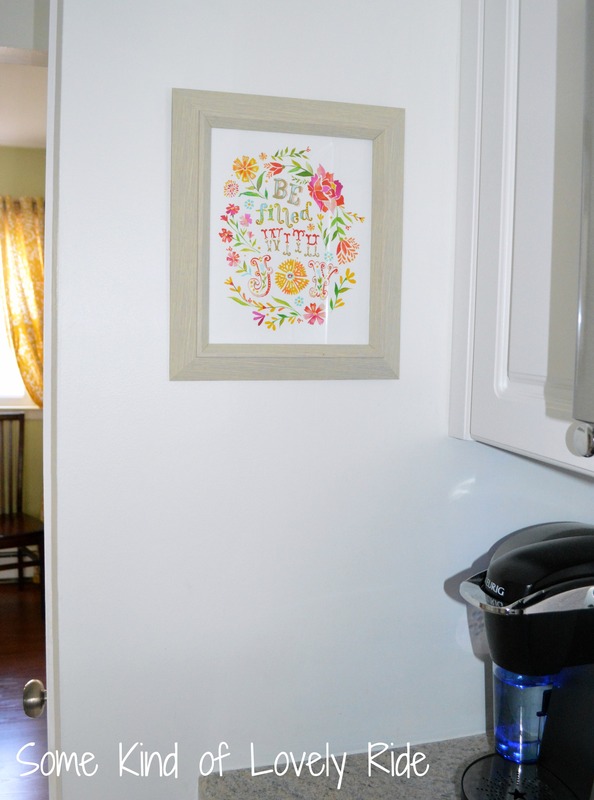 The giant bulletin board was a steal at TJMaxx last week – $20! I’m obsessed with our new sink & faucet. The deep undermount stainless steel sink plus the high arc of the faucet are a perfect combination, and the pull down sprayer feature of the faucet is a practical feature that comes in handy when washing big pots or, of course, when it’s bath time for Emma. And on the other side of the kitchen, we gained about a foot of counter space to the left of our oven, which is a perfect place for our Keurig. I moved my favorite Katie Daisy print to this spot, just to give me a daily reminder each morning. Here’s a good old before & after shot for you! I’ll come back tomorrow and give you a full run-down of where we got everything, just in case you happen to be in the kitchen-updating mood yourself! I’ve got big plans for my kitchen. I’m not sure what the timeline will be, but I know I can’t wait to get started on turning our small & outdated kitchen into a new happy place. The hubs & I plan to do some of the work ourselves, however we are in no way capable of handling a full DIY renovation – so we will definitely be consulting with people who understand construction & design tricks… as well as those pesky details like plumbing & electricity… while I remember building a circuit in Tech Ed class, that’s about the extent of it. Our kitchen is pretty small, and I think embracing the nice, clean look of white cabinets & white subway tile, combined with the part-country, part-modern look of butcher block countertop will be beautiful. 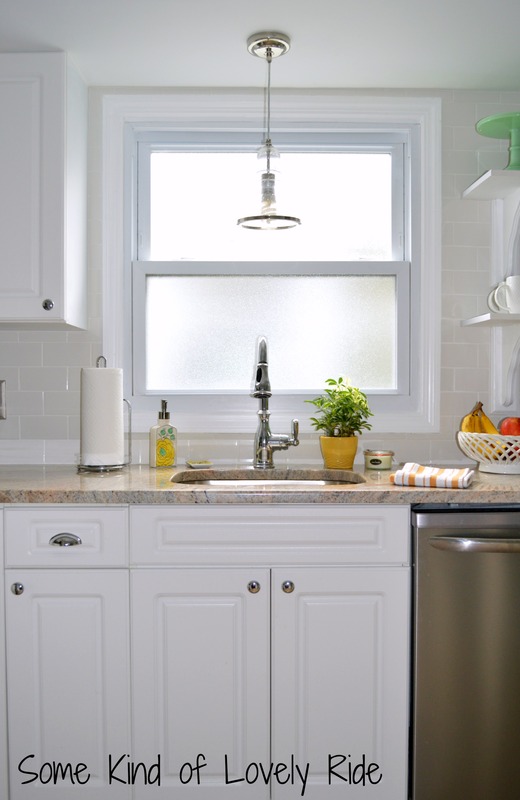 I am obsessed with apron sinks – and while I’m not sure we’ll have the space for that gorgeous double sink in my mood board, I definitely want that charming, rustic look of a deep, white apron sink – paired with a beautiful stainless steel faucet. Mmmm the thought of it makes me all giddy inside. 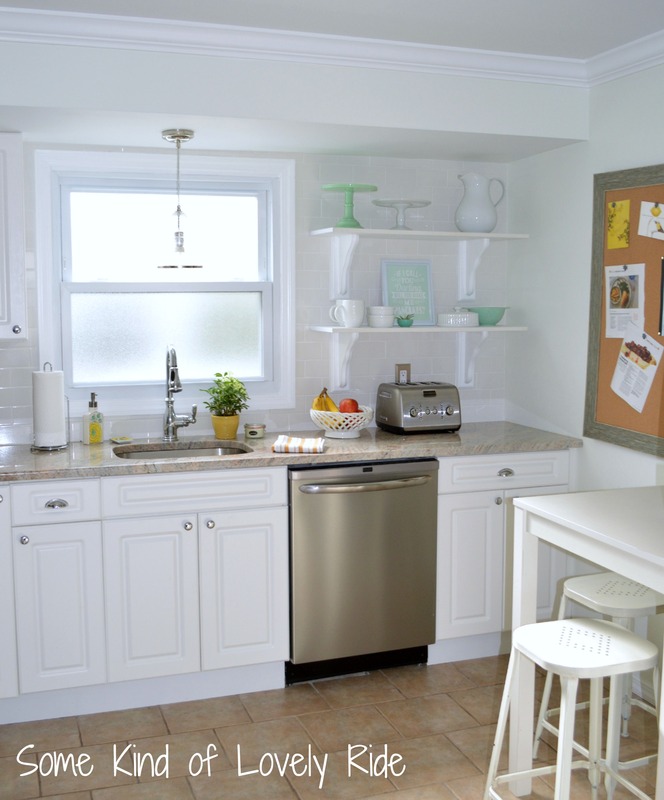 I love the Benjamin Moore color Grey Owl for the walls, and would incorporate grey grout in the backsplash tiling, too. 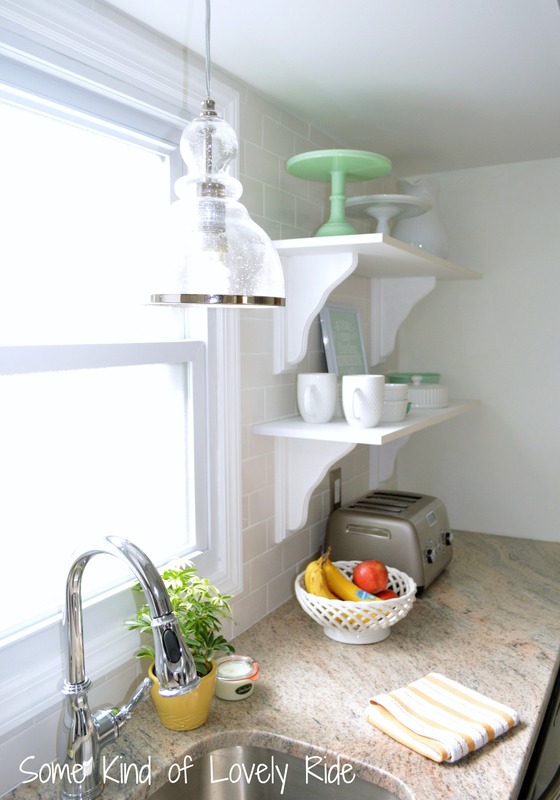 I think my Pistachio Kitchen Aid Stand Mixer will stand out against this color scheme, and I love the combination of mint, greens & yellow for accent colors – so fresh and cheery! 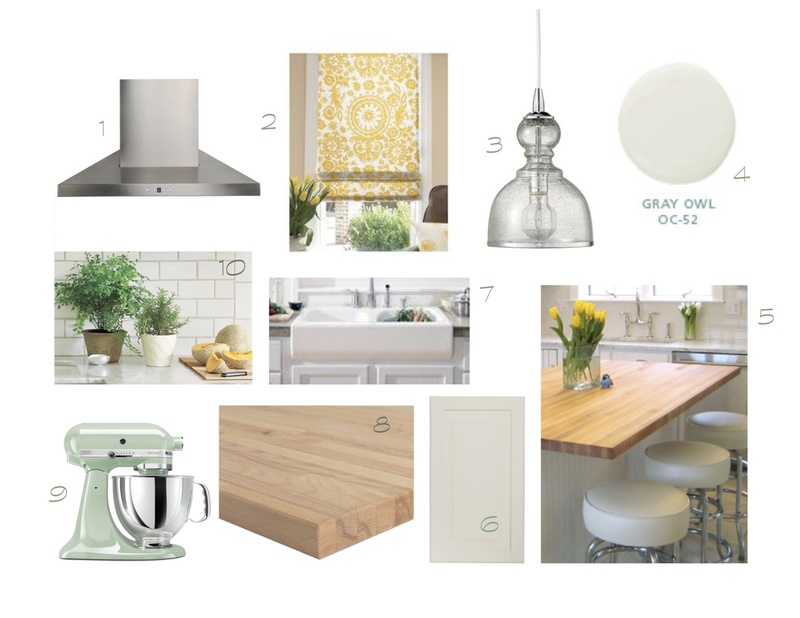 After our wedding, future hubby and I are super excited to completely renovate our kitchen. Since deciding to stay put in our apartment, we both feel it is a definite priority to squirrel away some money to turn our 50 year old kitchen into an updated domestic dream. This kitchen includes a larger floor plan and many more windows than possible in our apartment, but I just love the white cabinetry, open shelving, and lightness of the whole look. 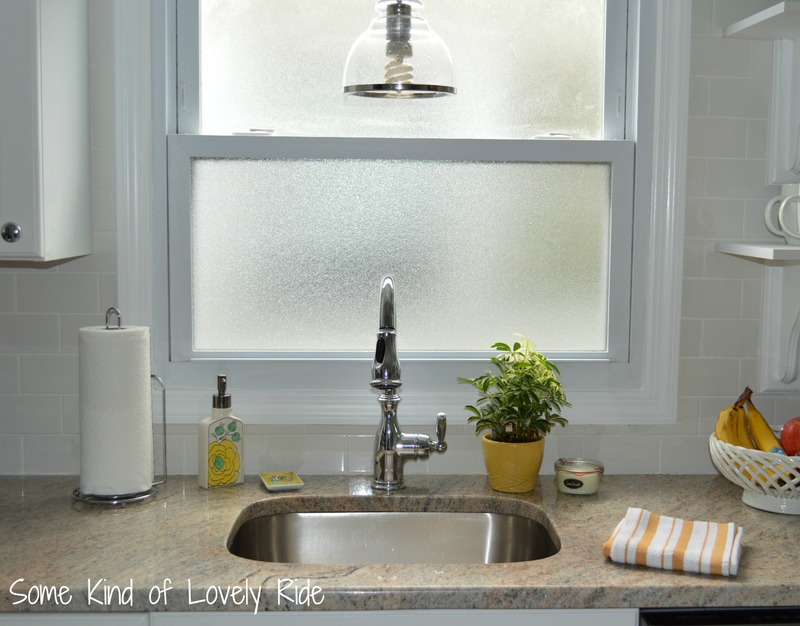 I found this lovely kitchen sink area on Pinterest, but it originally came from here. 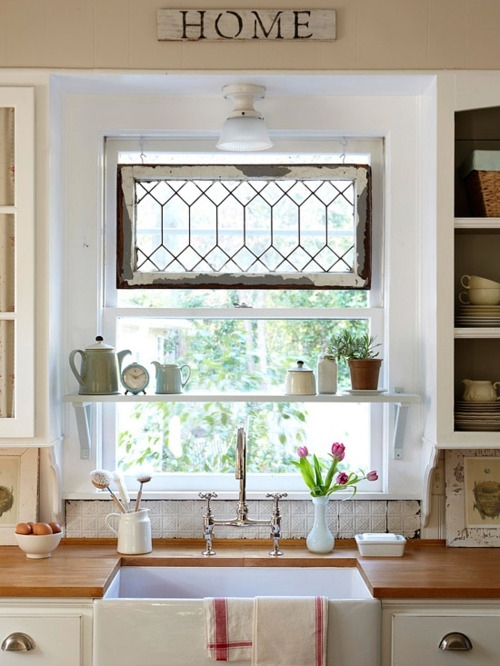 Don’t you just adore the shabby-chic accents and fresh look of that counter top? The pantry is a DIY project I may tackle pre-wedding. Check out a description of how this lovely one was spruced up here. 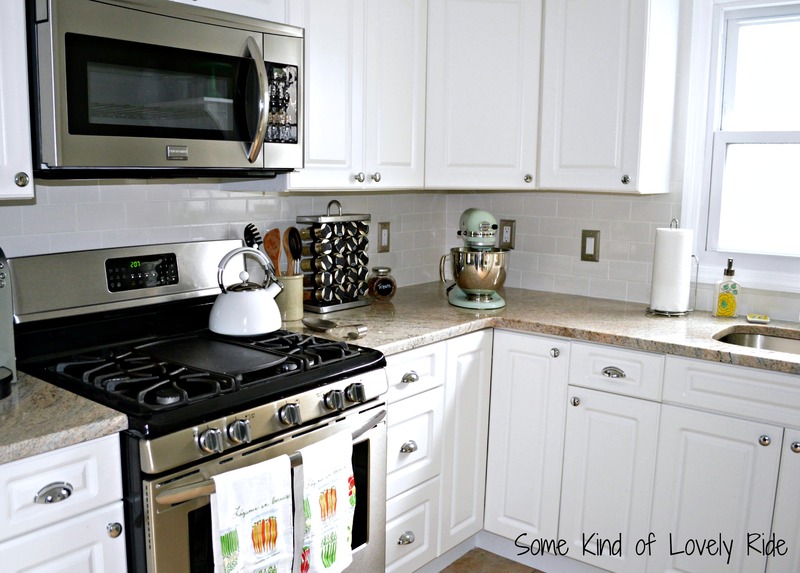 Hopefully this time, next year, I’ll be blogging about our new kitchen! I can barely wait- top of the priority list is a dishwasher & MORE COUNTER SPACE!